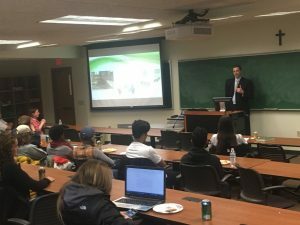 From the point of view of a CEO of a successful Environmental Firm, Mr. Hogan was able to advise students on what Environmental Consulting companies are looking for in college graduates, better preparing them for the job hunt. As a recent graduate, Mr. Cornett was able to offer a unique perspective and advise students on what worked and didn’t work for him in the search for entry level employment; and what they might do to stand out from the crowd when it comes time for them to start applying. Both Mr. Hogan and Mr. Cornett explained what an environmental consultant does, why, and what an entry level employee might expect to do in the profession. 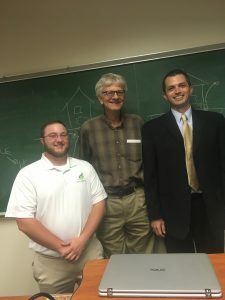 As one of the nations leading experts, Mr. Hogan also gave a guest lecture on Vapor Intrusion, focusing on how the landscape of Vapor Intrusion regulation seems to be shifting and how it affects the environmental industry. James and Tim are both Alumni of the University of Dayton and were very pleased for the opportunity to give back to their alma mater. Happy Thanksgiving from The ELAM Group!